African Cats, the latest Earth Day documentary from Disneynature, focuses on the wildlife of Kenya. It was shot on the Maasai Mara National Reserve, a 583 square mile game reserve in the southwest, which provides the filmmakers with a controlled environment in which they can creep dangerously close to the lions, cheetahs, and crocodiles that inhabit the land (not to mention the elephants and a variety of strange-looking fowl). 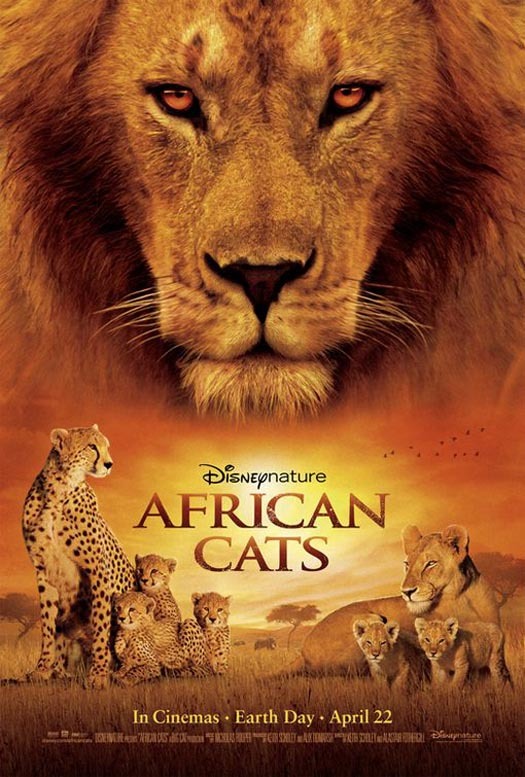 The film unfolds in the manner of a real-life Lion King as the footage is assembled into a storyline complete with narration by Samuel L. Jackson. Cute lion cubs grow to maturity, pride leaders are overthrown, and life in the wild moves on in much the same way as the viewers’. The film’s production quality lives up to that of its predecessors, which include the nature docs Earth and Oceans. The animals are often featured in close-ups so extreme that some viewers may squirm. One of the film’s many memorable accomplishments includes a high-speed tracking shot that follows a mother cheetah as she pursues a doomed gazelle. The scenes featuring predators in action may be a bit much for younger viewers, but nature lovers will surely be quite satisfied with the price of admission. African Cats opens wide in Philadelphia-area theaters today.